Since childhood, living overseas without a television, I loved listening to old radio shows that the Stars &Stripes Radio station would air. In adulthood this developed into an infatuation with talk radio. 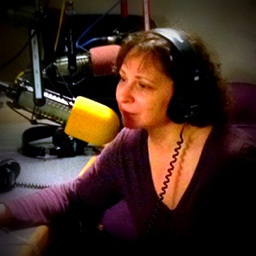 In the year following the eviction of the Occupy encampment in NYC I was given the opportunity to host the Occupy Wall Street radio show for t 99.5 FM WBAI radio station in NYC. Here are some of those shows, along with a link to shows I produced for the internet news provider Waging NonViolence. I enjoy making radio very much. It is a marvelous and magical medium. Upholding the belief that oral and written language skills develop best as they are applied to real purposes, the use of drama can play a remarkable role in this learning process. 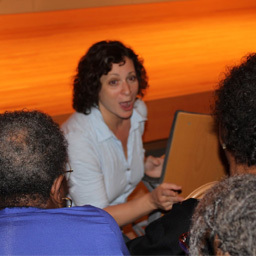 EVE SILBER is a highly experienced educator in the field of theatre-in-education, applying theatre as a tool for non-actors to explore vital social/health issues and evolve life skills. Having studied with Augusto Boal (Legislative Theatre, Theatre of the Oppressed), her expertise lies in linking the perpetual human capacity to learn with engaging and activating educational processes. She has worked as a teacher, director, and curriculum developer for programs throughout New York City serving diverse populations in schools, shelters, rehab centers and corporate settings. Facilitating inter-active, theatre based workshops she has worked extensively on the subjects of HIV prevention, conflict resolution, time-management and job-readiness. She received her M.A. in Educational Theatre from NYU and her B.S. in Performance Studies from Northwestern University.